As this is a blog devoted to pastiche Holmes adventures, I thought I'd direct your attention to this excellent interview with author and BSI member, Lyndsay Faye, at my favorite Sherlockian website, I Hear of Sherlock Everywhere. Good stuff here. "Pastiches shouldn't read like a stream of rehashed cliches. The story we are about to hear should be true--or at least sound it." 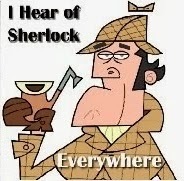 Click here or on the headline to have a read at I Hear of Sherlock Everywhere.